How Does a Sugar Crystal Grow? Sucrose, commonly known as table sugar, is a chemical compound that consists of glucose and fructose, and plays a crucial role in human nutrition. Upon consumption, sugar is quickly digested and serves as an efficient source of energy. Sugar solutions are commonly used in baking and cooking, as well as for various laboratory experiments in chemistry. Review the equation that allows you to calculate the mass of sucrose needed to prepare the solution: mass ÷ (mass + volume) = 0.01. “Volume” refers to the volume of the solution and 0.01 is 1 percent in decimal form (1/100). Note that the solution of this equation is mass = volume ÷ 99. Divide the volume of the solution by 99 to calculate the mass of sucrose needed. For example, to prepare 400 ml of the solution you would need 400 ml ÷ 99 = 4.040 g of sucrose. 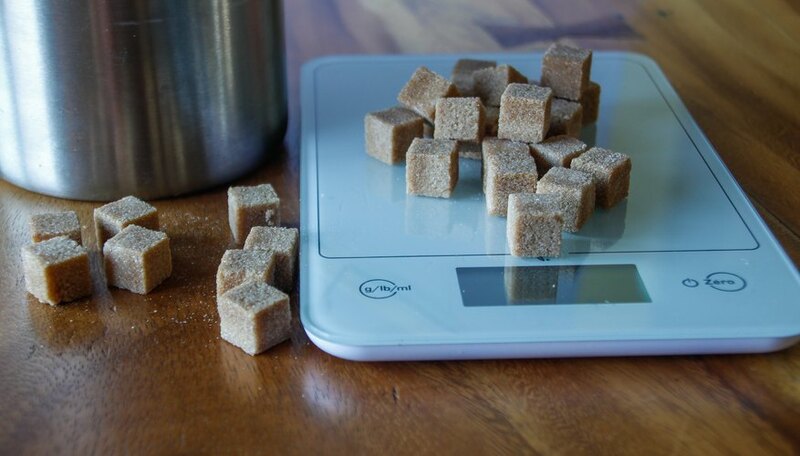 Weigh 4.04 g of sucrose on a scale. Pour distilled water into the graduated cylinder to measure the required volume. Add water until it reaches 400 ml. Transfer the water from the cylinder into the beaker. Add sucrose to the water in the beaker. Swirl the beaker for about 20 seconds until the sucrose is completely dissolved. Writer, Contributing. "How to Make a 1% Sucrose Solution." Sciencing, https://sciencing.com/make-1-sucrose-solution-6152862.html. 30 April 2018.